Passing thoughts: Critical look to the myth around AS14-66-9306 Apollo 14 photograph. Critical look to the myth around AS14-66-9306 Apollo 14 photograph. There is a quite famous photograph is hanging out in the internet - AS14-66-9306, a front view of the Apollo 14 Lunar Module. The unusual behavior of those crosshairs provides quite fertile ground for growing of any sort of conspiracy theories that lunar missions never exist since this photograph "is a hoax", i.e. "made in a studio and photo lab". As an example - this forum (quite interesting reading, by the way). Let's take a deep breath and think very carefully - why crosshairs do look like this? At first one need to understand what kind of camera have been used. 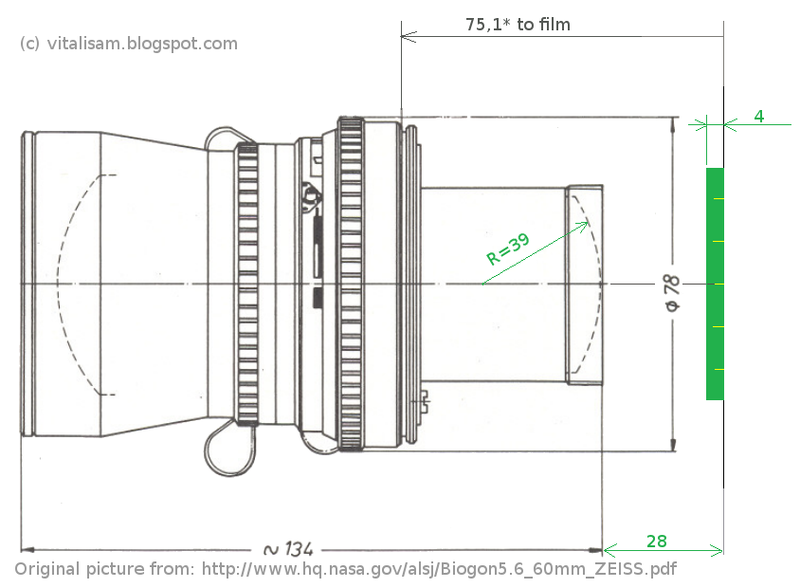 Apollo 14 carried a number of cameras for collecting data and recording various aspects of the mission, and we will be interesting in modified 70-millimeter stills Hasselblad EL Camera. The Hasselblad Lunar Camera was fitted with so called Reseau plate, which provides a means of correcting images for the effects of film distortion. From official site: The Reseau plate was engraved with a 5 x 5 grid of crosses . The intersections of the crosses were 10 mm apart and accurately calibrated to a tolerance of 0.002 mm. Except for the double-sized central cross, each of the four arms on a cross was 1 mm long and 0.02 mm wide. The crosses (also known as 'fiducials') were recorded on every exposed frame and provided a means of determining angular distances between objects in the field-of-view. But what actually happened to those crosshairs? 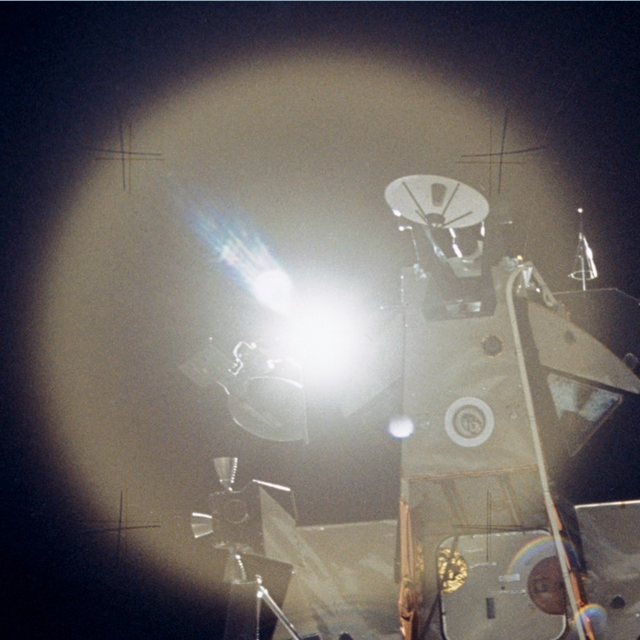 Many fans of conspiracy theories do believe that reticles are so strange because of photo lab processing, when few separated films where combined in order to get lunar module, landscape and powerful light source appeared together. Or due to another kind of manual processing with overlaying transparent film (as mentioned in above forum). But let's ask ourselves frankly: why those artifacts would be centered on the light-source? Is it too much of a coincidence? Lens of camera projects a very bright spot (the image of Sun) on a surface of the film. This bright spot starts to work as an independent source of light. Light goes back through the glass of Reseau plate, creating a shadow from crosshairs marker on other side of the glass. This kind of "phantom image" of markers goes to the film but radially shifted relative to the point of the Sun spot. But lets write some code! Just to visualize that strange things from the picture above. 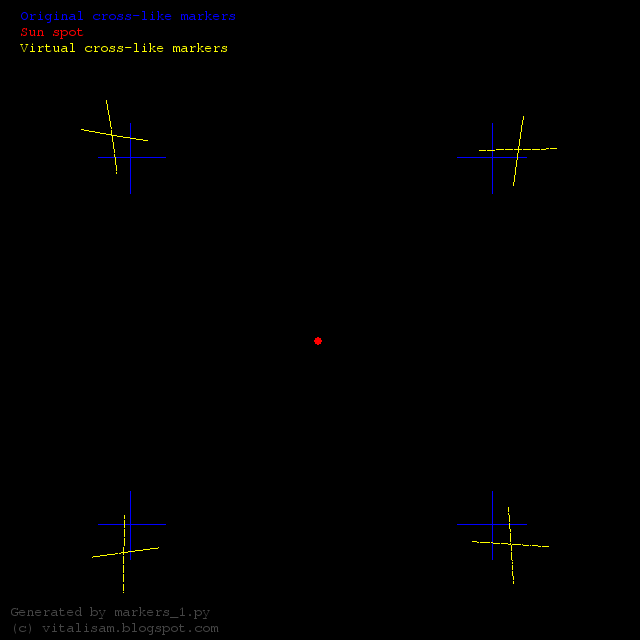 To do that I've used Python language with Pygame graphics library. As you can see, this picture quite strongly resembles reticles behavior from the original photograph. But there is a big "but": in order to have this effect a Film Gap 'G' (a gap between Reseau plate glass and the film) is set to be 3.5 mm. Could be a problem if one can imagine how the photo cartridge of Hasselblad camera is arranged. So we need a Version 2. Let's start with the basics. 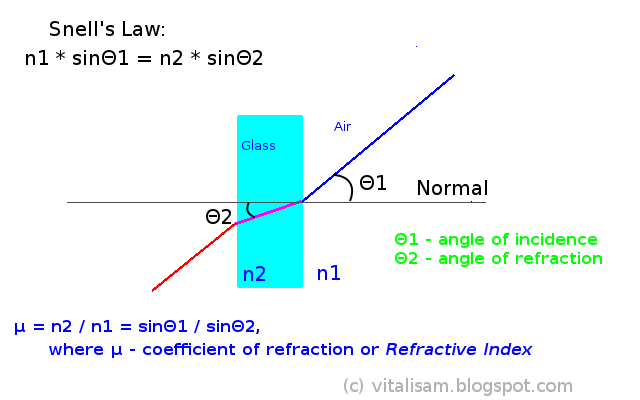 From the Law of Refraction (or Snell's Law or Snell-Descartes Law, wiki). When light travels from one medium to another, it bends or refracts. And Snell's Law tells us, what is the amount of bend. When a light ray travels from a rarer medium to a denser medium, the light ray bends towards the normal. When a light ray travels from a denser medium to a rarer medium, the light ray bends away from the normal. It is quite easy to understand that the incident ray and the emergent ray are parallel to each other. As one can see from the above simulation. And now we will try to understand an optical scheme of the Hasselblad 500EL camera, the Biogon f/5.6-60 mm special wide-angle lens, the Reseau plate glass and the film. This official document was very useful to understand more about lens and the camera. A thickness of the Reseau plate glass is 4 mm (I have found this from some unofficial internet sources). A film adjacent to the Reseau plate glass (without any visible gap) so that the focal plane of the lens is located on the back side of the glass. We can notice that the surface of the inner lens has a spherical shape; experimentally (by measurements) it has been found that the radius of that spherical surface is 39 mm. Other experimentally restored dimensions are in green color.